Click here to view Irina’s gallery at iokula.zenfolio.com. After throwing the porcelain on a wheel, I let the pieces dry to leather hard before I take a drill and make holes in the surface to let the light come through in interesting ways. The holes add extra interest with shadows and light, changing the surface in ways that are different from what glaze and color do with my saggar pieces. 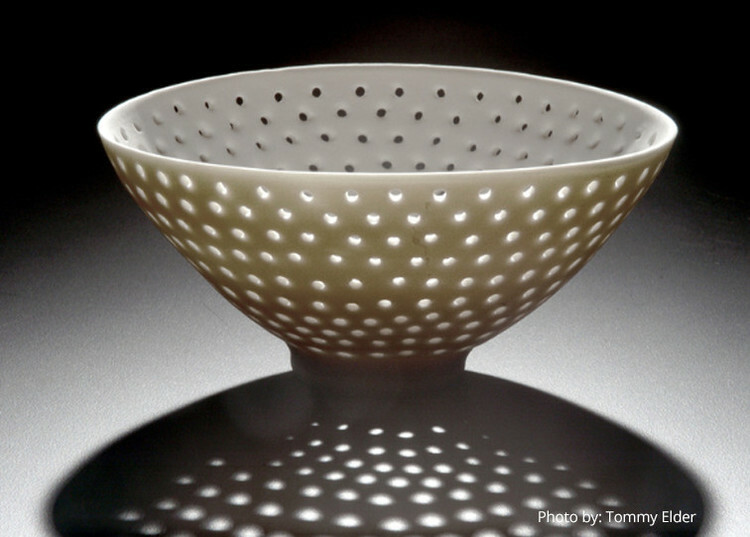 The perforated pieces, formed into vessel forms such as baskets, cups, bowls, teapots, and bottles, sometimes stacked in various arrangements, are fired at cone 6, suitable for this low fire kind of porcelain. Since the beginning of my relationship with clay more than 40 years ago, I have been drawn to the wheel to make the most of my work. Recently, I have begun to use the wheel in a different way. After deciding what form I want to create, I throw the particular shape that I need on the wheel and use this form as a mold. I also use plaster, cardboard, or plywood to make my molds. Clay molds are bisque fired. I then extrude porcelain coils and fill the coils into the various molds. After drying, I carefully remove the coiled sculpture from the mold and bisque fire. The final step in the process is oxidation high fire to cone 10. The high temperature causes the work to warp somewhat and give it a fluid appearance. Porcelain clay is a fascinating and challenging medium. It is a very seductive material because of its purity of color, its translucency, and its delicate appearance. Using porcelain coils results in a quiet and simple unglazed surface, with beautiful negative areas that glow with light. Each piece is a revelation as it emerges from the kiln; the anticipation of seeing them for the first time continues to inspire me.